Welcome Clark Howard viewers. If you enjoy this article then consider subscribing to the site via the links in the upper left. Note: The article below was written in 2009 and has not been updated for some time. For a more recent, nice video on the topic see CafeCredit.com's article: How To Get Credit Reports From All 3 bureaus? You are entitled to get a free credit report from all 3 of the major credit bureaus once every year. Its a good idea to check your reports and its FREE once a year so theres no reason not to do so. To do so go to the website AnnualCreditReport.com This is the official site offered through the credit bureaus to provide a free report to everyone. According to the Federal Trade Commission, AnnualCreditReport.com is the ONLY authorized source to get your free annual credit report under federal law. Its a good idea to check your credit reports to make sure that everything is accurate. The credit bureaus often make errors so you should check that they've got everything right. Checking your reports is also a good way to keep an eye out for unauthorized activity that is often a sign of identity theft. Warning: Don't be confused with other sites offering free credit reports that advertise heavily. The other sites are going to try to get you to sign up for a free trial service and then kick in a monthly fee. Make sure you go to AnnualCreditReport.com. AnnualCreditReport.com is the real site. Your Credit report is the full detail on all your credit accounts. It will track your payments on all your loans and credit cards. The credit report is different than your credit score. Your credit score is a number from the Fair Isaac company. The number ranges from 300 to 850. Read more about it in the online guide: Understanding Your FICO Score. To Buy Extras or not? 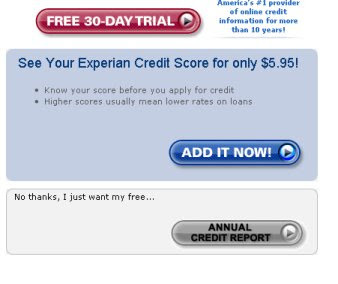 Edit Update: As of earlier this year Experian, one of the 3 credit bureaus, is currently not offering their credit score via myFICO.com. See more about that at this page from myFICO. Hopefully the 2 parties will find some agreement so people can continue to get all 3 FICO scores via myFICO. 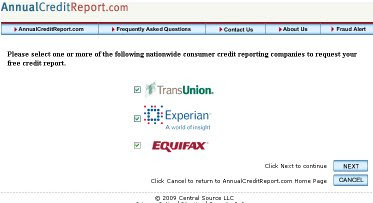 The process to get your credit reports from AnnualCreditReport.com is pretty easy. At the site you can get reports from TransUnion, Equifax and Experion. Pick your state in the 'start here' section shown and then hit the personal report button. 2) Give personal information. You'll next get to a page where you give them your name, date of birth, address and social security. Fill in all that information. From here you'll visit each of the 3 credit bureau sites in turn and get reports from them. When you get to a credit bureau you may have to verify some questions about your loan or credit accounts. They may ask you a few multiple choice questions. For example they may say "In July of 2003 you may have opened a mortgage..." and then ask you what company has your mortgage. Do not be alarmed if you don't t recognize everything in the questions asked. I got a question from one bureau asking me if people lived with me that I didn't recognize. These may be questions to differentiate you from another person with the same name or they may be trick questions. Simply answer all the questions honestly. When you get to the TransUnion site they will make you click through some stuff. They are going to offer additional stuff you can buy from them. If you want to buy a credit score then that will be extra. I'd recommend saying NO Thanks to these extra offers. Once you get past the sales pitches you'll get the full credit report. The credit report will have entries for any kind of loan or credit card you've had. Mortgages, student loans, car loans, charge cards, and credit cards will all be listed. 6) Review the TransUnion report for accuracy. I've blacked out some stuff to obscure details. Carefully look through all your entries in the credit report. Make sure you recognize everything there and that everything is accurate. If you've missed payments then they will show up with orange/red tone color boxes. I've done a good job making my Discover card payments and all the boxes are green. This is what you want. Its a good idea to save a copy of the TransUnion report for your reference. 7) Get and review your Experian report Continue on and go to the Experian site. Again they will try to sell you other services. I'd recommend declining these offers. Again you should check out all of the records in the report and make sure that everything is accurate. One key to look for is the "Status" entry as circle in yellow in the picture above. If the status says "never late" or anything like that then you're doing fine. So "Open/never late", "Paid, Closed / never late" or "Transferred / never late" are all good. 8) Get your Equifax report and review it. Unfortunately I can't give all the details on getting your Equifax report. I had problems with their website and was unable to get my report. But I've done it in previous years so I remember what its like. The process to get the Equifax report is pretty similar to the other two bureaus. When you get to the site they'll try and pitch an extra service and it's probably best to decline that. Then you'll get your full report. Save a copy of the report for your records. The formatting of the report will differ from Transunion and Experian a little bit. Hopefully everything on your credit report is accurate. But if there are any inaccuracies or activity that you did not authorize then you should deal with it soon. Errors on your report could be hurting your credit score and unauthorized activity is a sign of potential fraud such as identity theft. If you find anything on your reports that shouldn't be there then you should contact the individual bureau to deal with it. If you are unable to get a report from one of the bureaus online then I'd recommend you call their toll free number to find out why and request a report. If it doesn't work online then you may have entered information incorrectly so make sure to double check what you give for answers before you hit submit.